The extensive first aid training we started in Plymouth has been kept up, on the ship en-route and now at base. In the summer we ran through a major incident senario and since then, Richard our doctor has been running weekly first aid classes. Based around the "Airway, Breathing, Circulation" mantra, last week we reached "C" and after a lecture and practice on surogate veins made from old weather balloon and rubber tubing, willing victims were sought for practice. One method of coping with the darkness! 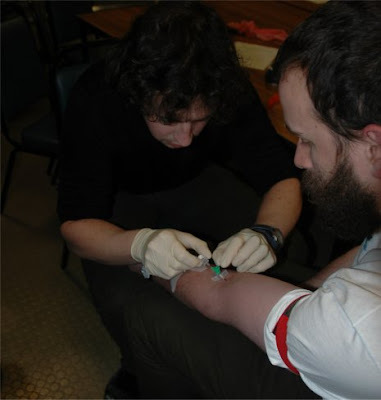 As one of the advanced first-aiders, responcible for assisting Richard if necessary, he was keen I should get some practice and donated his arm. The canula I'm inserting in the photo* gives intraveinous access to a patient, allowing the dispensing of drugs or the taking of blood samples. After carefully lining up, I popped the canular in, withdrew the needle and taped everything in place without too much discomfort to the patient. To my surprise, I wasn't at all squeamish. I guess I must be de-sensitized after all the bike crashes! *Cheers to Pete for the photo. Is that the beginings of a permed mullet I can see in that photo? Very nice!! It's a Billy The Fish mullet, and it rocks! I last had hair cut the day I handed in my notice in Cardiff, so I'll post a 'one year on' photo soon. It makes up for my crap beard!